Skwarnicki has been working on the LHCb experiment at CERN for more than a decade. He uses the collisions generated by the Large Hadron Collider to search for exotic combinations of quarks. Quarks are fundamental particles that bond together to form hadrons—the most common ones being the protons and neutrons found in the atoms that make up almost everything around us. For decades scientists had only ever seen hadrons containing three quarks, or a quark and an antiquark. Recent observations of particles made from four and five quarks have begun to challenge this paradigm. A question that remains about these exotic particles, however, is how the quarks are structured within them. This interest in how quarks bond stems from the study of a fundamental property of quarks called color charge. It’s not a coincidence that quarks prefer to bond into groups of two and three. In nature, scientists have found only color-neutral objects. They have found hadrons made up of a quark and an antiquark of opposite color charges (for example, red and anti-red), and hadrons made up of three quarks of different color charges (a red quark, a blue quark and a green quark, which also neutralize one another). For decades scientists have been looking for new kinds of quark combinations that break this mold—specifically, two matter-quarks bound together into a diquark. Because the force between color-charged quarks is orders of magnitude stronger than that of an electric field, most experts think that only hadrons which are completely color neutral are possible. But some theorists hold out hope that with the right combination, pockets that maintain a non-neutral color charge could momentarily exist. If they could find a combination of quarks that are not completely color-neutral, “it would open a new world,” says Ahmed Ali, a theoretical physicist at DESY. And if they could find a way to harness that charge, he says, “the implications could be far-reaching.” The last time scientists figured out how to separate the charges fundamental particles, the result was electricity. Scientists think it’s physically impossible to isolate a non-neutral quark cluster. But some hope that in the collisions generated by the LHC, one of these theoretical diquark combinations could momentarily manifest itself. “Finding that experimentally would be a breakthrough,” Ali says. 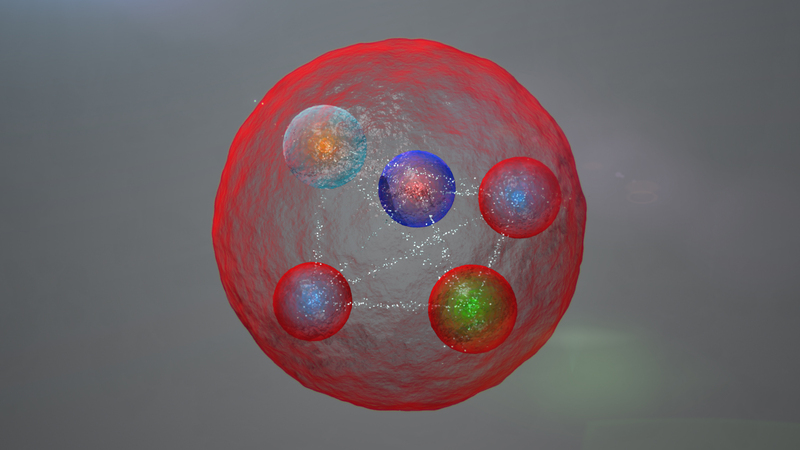 Scientists have made some promising observations that show complex combinations of quarks. Since 2003, numerous experiments have observed particles that appear to be made up of four quarks. And in 2015, LHCb announced the discovery of the first particle made up of five quarks—a pentaquark. But this latest analysis by the LHCb collaboration raises questions about the identity of this pentaquark—and may have taken scientists back to square one in the search for a particle that could shed light on questions about color. The new result has reignited a debate about what pentaquarks actually look like. “The key question is how the quarks organize themselves,” Ali says. Theorist Marek Karliner at Tel Aviv University, and his colleague Jon Rosner at the University of Chicago, were not surprised at the appearance of three separate pentaquarks. “The three masses just happen to sit right where you would expect them,” Karliner says. That is, right where you would expect them if the pentaquark isn’t a tightly bound pentaquark, but rather a new type of atomic nucleus, formed from two well-understood, color-neutral hadrons—one made up of two quarks, and one made up of three. Their reasoning? Simple addition. “We expect the mass of a nucleus to be very close to the sum of its constituent parts,” he says. The mass of the lightest pentaquark is suspiciously close to the combined masses of a two-quark particle called a D-meson and a three-quark particle called a Sigma-C baryon. The heavier two pentaquarks could be made of the same two particles, but with their internal quarks misaligned—a configuration that slightly bumps up their energy and therefore bumps up the overall mass of the pentaquark. Another feature that jumped out at Karliner is the lifetime of these particles. In this nuclear interpretation of the pentaquark, the two clusters of quarks are distinct and feel only a weak pull towards each other, forming a new type of meta-stable atomic nucleus. Some scientists think a tightly bound pentaquark could have pockets of non-neutral color charge. What he really wants to find is evidence of a tightly bound pentaquark, in which the five quarks are held close together by the strong force. Ali suspects that within a true tightly bound pentaquark, the quark colors could mix in a way that would allow for some non-neutral color charge. Antimatter has fueled many a supernatural tale. It's also fascinating all by itself.